In 1933, the Roesch Memorial Stadium is completed. This stadium is located at the Best Street and Masten Avenue intersection across the street from the 106th Armory. It is named Charles E. Roesch who is mayor of Buffalo from 1930 to 1934. 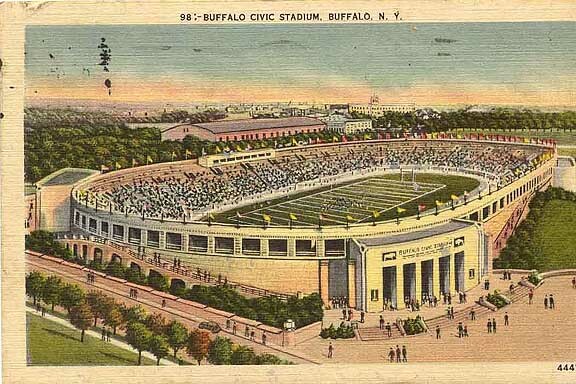 The name is changed to Civic Stadium about 1938 and to War Memorial Stadium in 1960. For decades, the local name was The Rockpile. Later, major changes will be made to the facility to better provide for amateur sports practice and events and the facility is renamed the Johnnie B. Wiley Amateur Athletic Sports Pavilion in 1997. ..| ...Home Page...| ..Buffalo Architecture Index...| ..Buffalo History Index...| .. E-Mail ...| ..